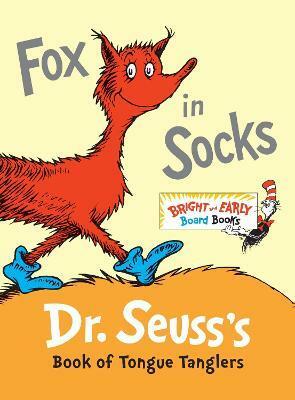 Dr. Seuss's Fox in Socks has been troubling tongues--and garnering giggles--since 1965. Written specifically to be read aloud, it features a tricky fox in socks and the progressively more difficult tongue-twisting games he plays on his exasperated friend Mr. Knox. Now available for the first time in an abridged, sturdy, board book edition, this beloved classic will have babies of all ages laughing with--and at--their parents as they struggle, like Knox, to blab such blibber blubber as muddle puddle tweetle poodle beetle noodle bottle paddle battle! Theodor Seuss Geisel--aka Dr. Seuss--is, quite simply, one of the most beloved children's book authors of all time. The forty-four books he wrote and illustrated under the name Dr. Seuss (and others that he wrote but did not illustrate, including some under the pseudonyms Theo. LeSieg and Rosetta Stone) have been translated into thirty languages. Hundreds of millions of copies have found their way into homes and hearts around the world. Dr. Seuss's long list of awards includes Caldecott Honors for McElligot's Pool, If I Ran the Zoo, and Bartholomew and the Oobleck; the Pulitzer Prize; and eight honorary doctorates. Works based on his original stories have won three Oscars, three Emmys, three Grammys, and a Peabody.